Stockhorn Arena formerly known as Arena Thun is a purpose built football stadium located in the small Swiss city of Thun within the Canton of Bern. 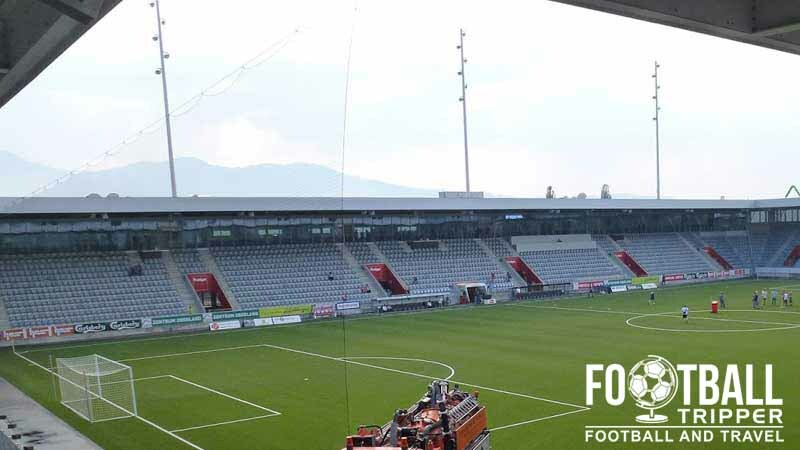 Home to FC Thun 1898, the ground was completed in July 2011 at a cost of €140 million with room for 10,000 spectators. 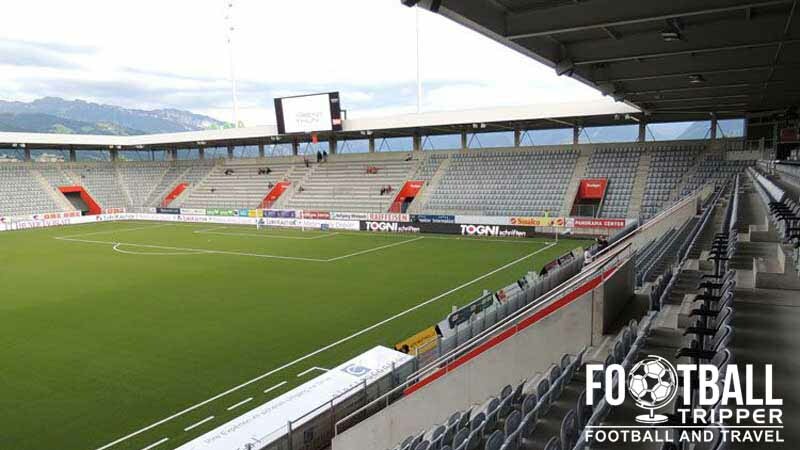 Before moving into Arena Thun in 2011, FC Thun played their home matches at Stadion Lachen which served the club well for over 57 years between 1954-2011 but was no longer fit for purpose. In the early 2000s, the Swiss Football Association re-evaluated their stadium safety criteria with Stadion Lachen and FC Lucerne’s ground found to fall short of requirements. Given a grace period to either renovate or build a new stadium. 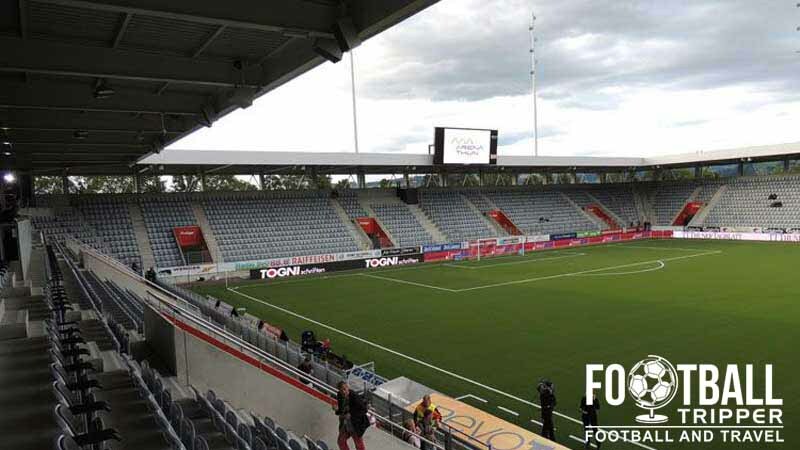 FC Thun expressed a desire to construct a new state-of-the-art ground but the club initially faced funding issues. Traditionally stadiums in Switzerland and other European countries were financed by public funds as they are seen as belonging to the community, but the citizens of Thun rejected funding the new stadium with taxpayer money in 2006. Facing an uncertain future without a stadium, FC Thun explored other financing options and eventual signed a deal with a commercial property development company, HRS, who offered to invest in a new stadium in a new location complete with shopping centre, approximately 1.8 km northwest of Stadion Lachen, on the outskirts of town. The club agreed to the proposal and constructed began in the Spring of 2010, with the inaugural match, a 2-2 draw, held little over a year later against 1. FC Köln on the 9th July 2011. In February 2014 the operator of the stadium announced they had sold the naming rights with Arena Thun becoming Stockhorn Arena. The Stockhorn Arena is comprised of four stands: North, East, South and West. Away fans are housed within the eastern half of the northern stand as marked by the greyed out section in the above seating plan. Referred to as the Nord Tribune in Swiss, the Gäste-Sektor refers to the seating blocks D9 and D10. 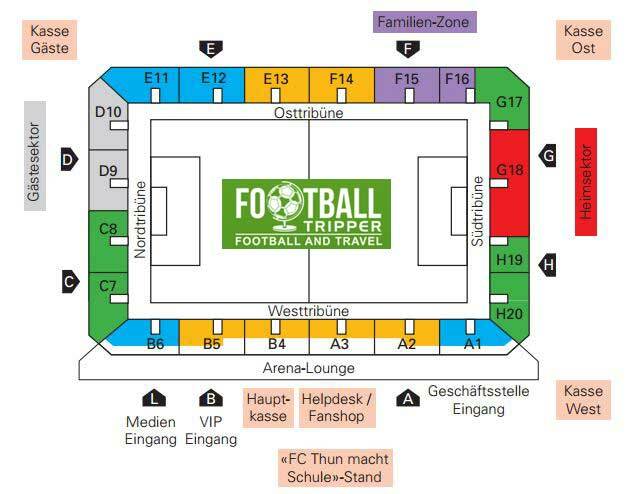 Tickets for away fans cost 25.00 CHF for all league matches. The Fan Shop located at Stockhorn Arena is only open on Wednesdays between 1.30 pm and 6.30 pm which means that you may wish to browse official merchandise by visiting FC Thun’s online store instead. The Fan Shop at Stockhorn Arena is also open for up to two hours before kick-off on matchdays and for up to one hour after the full time whistle. It doesn’t appear as if stadium tours of Stockhorn Arena are currently available. If this ever changes we’ll be sure to update this section. 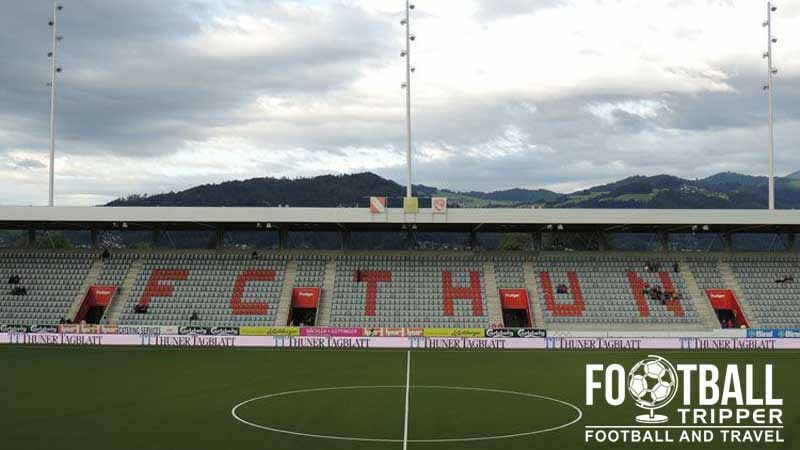 Single tickets to see FC Thun play at home can either be purchased in advanced of the match online and then printed at home, or obtained before kick-off from the various ticket sellers dotted outside the ground. Please note that there is a price increase of around 8.00 CHF when both FC Basel and the Young Boys come to town. Stockhorn Arena is located 2.7 km west of Thun’s central area around the railway station adjacent to the River Aare. It would likely take the average Football Tripper the best part of 35 minutes which means public transport is likely preferred – particularly when it is included as part of your match ticket! Parking is available at the nearby “Panorama Center” on a first-come first-served basis for the flat rate of 10.00 CHF. Thun Railway Station is well connected to the rest of Switzerland with numerous InterCity and RegioExpress services around the country. There are even InterRail services to the likes of Paris, Milan and Berlin. From the central train station you can catch bus number 3 to Stockhorn Arena in just under 15 minutes. On matchdays additional services are run in order to satisfy the increased demand and to ease congestion. Bern Airport, 26 km north, is the closest International Airport to the City of Thun with the nearby Flugplatz Thun only used by private and non-commercial airlines. The two main clusters of hotels can be found within Thun City centre or southwards around Lachenkanal where there is a Holiday Inn and well priced Alpha Thun Hotel. Generally speaking its much more expensive to stay near to the city centre with Hotel Schwert and Hotel Freienhof Thun AG close to the train station appearing to be two of the more affordable options.